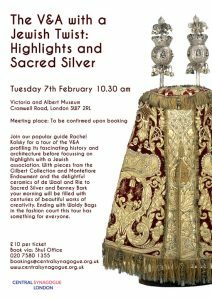 Join our popular guide Rachel Kolsky for a tour of the V&A profiling its fascinating history and architecture before focussing on highlights with a Jewish association. With pieces from the Gilbert Collection and Montefiore Endowment and the delightful ceramics of de Waal and Rie to Sacred Silver and Benney Bark your morning will be filled with centuries of beautiful works of creativity. Ending with Waldy Bags in the fashion court this tour has something for everyone.